Published March 24, 2014 at 370 × 250 in Spiritual. Ship Rock - New Mexico In the morning, while looking at the map I found a spider sitting on it. The Navaho believe to find a spider is very lucky and sacred. 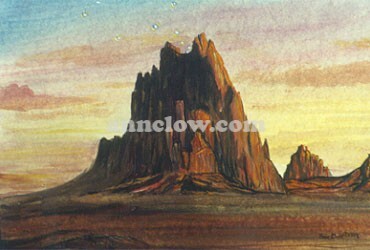 When I arrived at Shiprock I met a native woman who told me the story about the magical rock. Long ago, there was a war and it is said that the natives hid inside the rock as it spread wings and flew them out of danger. Ship rock means rock with wings. Folklore says that when the natives die, their spirits go into the rock and are reborn as spiders. Most who have come to this sacred place have discovered a spider that is said to have guided them here.